My first DragonCon changed my life. That’s not an exaggeration. Before Labor Day weekend 2003, I had a limited social life, loving parents who were a little bit worried about my limited social life, and an ever-growing pile of unpublished manuscripts, cared for and then abandoned as meaningless to anyone but me. Now I have a husband, a fun bunch of friends with whom I love to hang out, loving parents who aren’t quite so worried anymore, a score of produced radio plays, four published short stories, a published novel and another one on the way — all because I had nothing to do during the long weekend and decided to check out DragonCon. “Firegale at the Festival,” my short story in Gilded Dragonfly Books‘ Legends of the Dragon, Vol. 1 — a collection of stories set amid the wonderful weirdness that is DragonCon — can be read as my love letter to the event. But for the “nutshell version,” here are five things I love about DragonCon. The Atlanta Radio Theatre Company! Most of my life changes can be traced directly to this organization, which performs radio drama live and aired and podcasted, keeping the venerable art form alive. ARTC performs at DragonCon every year, and nearly every year it acquires new members who saw and admired at least one of its shows at the Con. I was one of them. I’ve always loved acting, but my vocal strengths are greater than my physical ones, so I thought ARTC would be perfect for me, and I would be perfect for it. I couldn’t have guessed how perfect, or anticipated that my greater contribution to the company would be as a writer. I met my husband Matt at my first ARTC rehearsal. In 2004, when the company performed my first audio drama, The House Across the Way, I saw the work of my imagination come to mean something to more people than just myself and my family. An ARTC-connected friend also put me in touch with Nancy Knight, one of the main editors at Gilded Dragonfly Books, and my career as a published writer was launched at last; Bill Ritch, ARTC’s fearless leader, has been my “book doctor” — critic, supporter, giver of invaluable feedback — for some years now. Besides, that gang of people are fun to spend time with, and I knew it from that first rehearsal, when I learned they love the same geeky stuff that delights me. ARTC will get a “five things” blog of its own in the future. It warms my heart to see the restaurants and other businesses around Peachtree Corners open their arms to the vast crowd of nerds with money to spend. Posters appear in their windows to invite us in, as much signs of a season as holly wreaths in December. Some stores go all out. I’m especially fond of Caribou Coffee, which welcomes us Con-goers with specialty coffees with names like “Gandalf the White” and “Jack the Pumpkin King.” (One drawback: the specialty coffees change every year, so if you fell in love with “Jack the Pumpkin King” back at DragonCon 2013, too bad; you won’t see it again.) And everywhere I go in the vicinity, I’m sure to run into a crowd of people with DragonCon badges, people who are bound to share at least some of my enthusiasms. For a few days, I can feel truly at home in the great big city. We all have our own ways to display our love for our favorite elements of geek culture. My husband goes to the Con in “civilian” clothes, but sports T-shirts that declare his enjoyment of Doctor Who, Futurama, Captain America, the Guardians of the Galaxy, Charlie Brown, and the like. I go in costume, but rather than dress as a specific character, I don Renaissance clothing, in which I can imagine myself as any number of people and can express my enthusiasm for mythic fantasy literature in general. And of course we meet hordes of cosplayers who have transformed themselves into their favorite characters, from Superman and Batman to the Doctor to Princess Leia to Captain Kirk. When we read science fiction, fantasy, and comics, we get to step into the shoes of heroes and villains in larger-than-real-life adventures. At DragonCon, we can wear those shoes, and wear our passions on our sleeve — literally. I love to talk about my favorite books and movies, but in my ordinary work-a-day world, not many people I run into have even heard of Terry Pratchett or Juliet Marillier. All that changes when I come to DragonCon, where special “tracks” are devoted to talking over sci-fi literature, fantasy literature, YA sci-fi and fantasy literature, writing, British sci-fi and fantasy, comics, animation, anime, puppetry, Star Wars, Star Trek, Tolkien, Joss Whedon, alternate history (a.k.a. steampunk)…. get the idea? Whatever I’m into, I can find a cool discussion of it. It’s paradise. DragonCon 2015 begins one week from today. This year, Gilded Dragonfly Books will have a sales table in the Exhibit Hall, where our short-story anthologies and novels, including Legends of the Dragon, Vol. 1 and Atterwald, will be available for purchase and signing. Maybe I’ll see you there! I wrote my first full-length fantasy novel when I was eleven years old. I was no prodigy, and the book was as dreadful as you might imagine; I’m quite glad no one outside my immediate family and our circle of friends in those days will ever read a word of it. It was called Budgie Town, and it concerned a community of parakeets. I’ve forgotten most of it, though I seem to recall they had their own words for heaven and hell and their own value system, and they had to deal with a family of trouble-making boa constrictors. What I remember most clearly, however, is that this first ill-advised foray into epic adventure territory was inspired by my favorite book at the time, Richard Adams’ Watership Down. Adams’ book was not the first animal fantasy to capture my interest. Prior to reading it, I’d been taken with Kipling’s The Jungle Book (and initially disappointed with the Disney film for taking such liberties with great source material), as well as Grahame’s The Wind in the Willows. But Watership Down moved me on a deeper level, though at eleven I could not have explained why. Despite its occasional references to the actual world, Adams’ novel immerses itself so deeply in the culture and predicaments of its rabbit characters that it reads like a detailed second-world fantasy. Nonhuman characters intrigue me. They just do. I may be partial these days to dragons, giants, gryphons, wer-creatures, and the like, but my fascination with the nonhuman started with animals. Adams’ novel has a cast of characters with clearly defined personalities, three standing out: Hazel, whose clear-headed common sense fits him for a leadership role to which he could never have aspired in a traditional warren, where the biggest and strongest always rule; Fiver, the tremulous runt whose prophetic visions set the plot in motion and also constitute the only supernatural aspect of the novel; and Bigwig, the officer, large, brash, outspoken, and a greater hero in the end than the reader could have expected in the beginning. These are the three through whose eyes we see, and while they may display such human attributes as love, loyalty, courage, and grief, they are clearly and cleverly not human. We’re drawn to their difference as well as their likeness. As with To Kill a Mockingbird, I saw the movie first, and when I found out it was based on a book, of course I had to read it. I still like the animated film, and I have to give director Martin Rosen credit for including as much of the story as he could fit into an hour and a half running time and not downplaying its more brutal aspects. (The movie version of General Woundwort, the story’s villain, is genuinely terrifying.) But the book swept me into a much larger, richer tale than the movie could have told. The rabbits have their own culture. One of the most crucial elements of the book that the movie largely omits is the rabbits’ mythology (though it does make an appearance in the movie’s opening sequence). Rabbis have an oral tradition, and storytellers are highly regarded. At several points in the novel, we hear tales of the exploits of El-ahrairah, the rabbit trickster folk hero, whose legendary cunning and resourcefulness inspire the rabbit heroes when they need it most. The rabbits also have their own language, which adds to the story’s second-world fantasy feel. There’s a great moment at the climax when Bigwig tells the invading General Woundwort to eat excrement, in the Lapine language of course. The moment wouldn’t work half as brilliantly in standard English. I think I can say this without going too far into Spoiler territory, for after all, the heroes are rabbits — prey animals, and, by the very laws of nature, the ultimate underdogs. When they meet head-on every obstacle their perilous journey can throw at them, it’s suspenseful (“how are they going to get out of this one?”) and satisfying. The novel isn’t perfect, and I’m not about to claim it is. One of the most frequent charges leveled against it is that of sexism, both because females are invisible for the novel’s first two-thirds and because the rabbit culture has strict gender roles. At eleven I wasn’t politically aware enough to pick up on the latter, but I felt the former keenly, and I satisfied my need for a heroine by imagining Fiver as female. (It worked just fine in my head, okay?) On my last couple of re-reads, however, I’ve paid closer attention to the most important female character Adams actually wrote. Trapped in an overly regulated warren run by the tyrant Woundwort, Hyzenthlay rebels, and even when her efforts come to naught, she keeps the rebellion alive in her heart. She might seem beaten down when Bigwig first meets her, yet her verses move even his un-poetical heart, and she becomes his most useful ally. In the climax, when the bucks are engaged in combat, Hyzenthlay keeps order by assuming the storyteller’s mantle. No mere distressed damsel, she, but a wise, brave figure whom Adams himself liked well enough to give a prominent role in the regrettably less awesome sequel, Tales of Watership Down. David Clement-Davies, The Sight. The lead characters are wolves, predators rather than prey, yet they are still sympathetic and relate-able. The story centers on Larka, a female savior-prophet, and her antagonist is female as well, so this story should satisfy readers who find Watership Down too male-heavy. Dorothy Hearst, The Promise of the Wolves. Here’s another wolf-centric story with a female lead. This one has a sequel, Secrets of the Wolves, that I’ve yet to read. Robin Hawdon, A Rustle in the Grass. This epic military struggle centers on ants. It’s a compelling read with some strong characters, including a storyteller and a wise, quick-thinking military leader, but be warned: the ant society is more sexist than Adams’ rabbit society ever thought of being, and it should most please readers who think Watership Down isn’t grim enough. William Horwood, The Stonor Eagles. Horwood’s fantasy saga involving moles, Duncton Wood, is better known, and a good read, but I prefer this novel, in which an artist’s coming-of-age and a tale of struggle and triumph among sea eagles run parallel. The main characters in the eagles’ story are Cuillin, a female far from home, and her daughter, Mourne, so again, readers who like a significant female presence in their animal fantasy should appreciate this one. Four weekends from now, Atlanta, GA will turn Geek. Hordes of stormtroopers, Starfleet officers, kings, queens, princesses, knights, fairies, gargoyles, superheroes, supervillains, Weeping Angels, and various incarnations of the Doctor will invade its streets. That’s right — DragonCon is coming. This 2015 Con will be my twelfth overall, and my eleventh performing with the Atlanta Radio Theatre Company, and of course I’m anticipating all the things I usually anticipate. (A “Five Things I Love about… DragonCon” blog is in the offing.) But this Con will be special to me, for two big reasons. First, Gilded Dragonfly Books will have a booth in the Exhibit Hall, where its short story anthologies and its novels, including Atterwald, will be on sale. 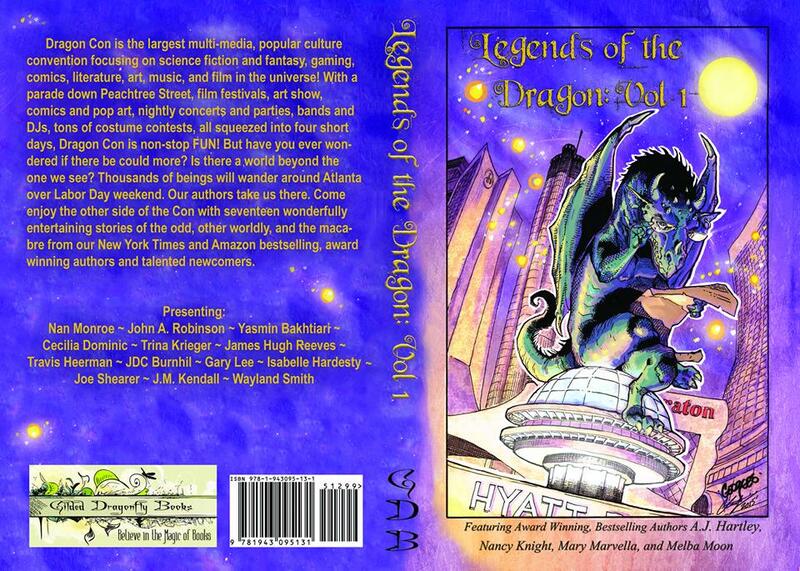 Second, a brand-new anthology, Legends of the Dragon, Vol. 1, will be available. This one is full of stories set at DragonCon itself. Check out the gorgeous cover art! Only twelve of us are left in the world. We dwell in cities far apart and conceal ourselves in underground lairs, emerging only in the forms of shadows or shrunken to a salamander’s size. We might perish of loneliness, were it not for the wizards who care for us. In the early years of the Thousands, I lived under Underground Atlanta. Under cover of night I would take to the sky. I’d rise from the grate a stream of intangible black and shoot upward, swift as an arrow, toward the stars. I’d twirl around the golden dome of the Capitol and dive and loop around the shining banners of Marriott and Hilton and indulge in a wild, vain fancy of soaring in my true form, the moonlight glancing off my outspread wings, my black scales a shimmering florescent blue, a thing of beauty to delight the eyes of the lost, tired, or old in heart who might glance up from the streets below. When I first fledged, my wizard caretaker gave me my adult name, Firegale, and told me my mission: to study what humankind says about us. That meant I had to read every word humans have written about us, and watch every movie and television show and listen to every song or radio play I could find that mentioned us. I spent many an afternoon crouched in the corner of a dark movie theater, a shadow among shadows, and many an evening trailing along library shelves. My wizard helped, paying for a cable television hookup in my lair and bringing me armfuls of books and DVDs and Blu-Rays. At times it felt a bit overwhelming. But in truth, I loved my work. There began my passion for what humankind terms “the fantastic,” the stories that take place in great lands that never were, where people live as people never lived, yet somehow manage to tell truths missing from tales that deal in literal realities. I learned the fantastic reaches something eternal in us, beyond trends and customs and the tides of politics. Yes, us, for the fantastic taught me how much I had in common with humankind. Lost in the fantastic, I was never lonely. I wasn’t satisfied with learning what humans say about us. I wanted to learn their stories about elves as well, and trolls, goblins, werewolves, vampires, ghosts, mer-folk. I wanted to know of Jedi and Sith, of Romulans, Klingons, and Vulcans, of Time Lords and Companions, of superheroes and supervillains. Such tales were my food. I grew so big on them that I imagined myself bursting through the pavement that covered me. Each year one time and place was dearer to me than all the rest. Then and there I could swim in a great sea of the fantastic, and everywhere I turned I found stories to feast upon. At this time, my wizard caretaker worked upon me the magic I couldn’t work upon myself, to turn me, for four short days, into a human. The festival was called, to my great delight, DragonCon. Conventional wisdom holds that one should always read the book, then see the movie, but for much of my formative years, I didn’t follow this wisdom. I saw quite a lot of movies from the Classic Era (1920s through mid-1960s), and if I liked such a movie and learned it was based on a book, I would make a point of tracking down the book. I knew that as much as I’d loved the movie, the book would give me more — more details about and more insights into a story that had already engaged my interest. So it was that I read Harper Lee’s wonderful novel To Kill a Mockingbird after I’d already seen and fallen in love with the 1962 film. My experience with the novel in no way diminished my love for the movie, but I have to love the book a little more, because, well, it gives me more. First, it led to the movie that turned out to be the gold standard by which all book-to-film adaptations should be judged. We all know Gregory Peck is the definitive Atticus Finch; he was Harper Lee’s first and only choice for the role. He’s also the only bankable name in the cast. The filmmakers chose to surround him with less well-known but no less superb actors who fit their roles to perfection: Frank Overton as Sheriff Heck Tate (who shines in his final scene with Peck), Paul Fix as Judge Taylor, Rosemary Murphy as Miss Maudie Atkinson, Brock Peters as Tom Robinson, and Collin Wilcox as Mayella Ewell. (A note on Wilcox as Mayella: having read the book, she knew that Mayella had been sexually abused by her father, and while the movie couldn’t state that detail outright, the actress seized upon it and let it inform her portrayal, so that every bit of body language makes Mayella’s history of abuse clear.) Robert Duvall was so good in his five minutes of screen time as Boo Radley that he became a star thereafter. The children who play the Finch siblings, Mary Badham and Philip Alford, were not child actors but “civilians.” None of them had any glamorous-Hollywood veneer, which is why they made such convincing denizens of Maycomb County, AL. Also, Elmer Bernstein’s musical score simply could never be improved upon — one of the biggest reasons why any effort to remake this film would be a foolhardy blunder of Charge of the Light Brigade proportions. Scout Finch is a smart, funny, curious, utterly endearing child protagonist. We all remember her great moments from the movie: her attack on poor freckled Walter Cunningham and her subsequent embarrassment of him at the lunch table; her innocent thwarting of the lynch mob at the jailhouse; her bobbing along in her HAM costume as her brother valiantly tries to keep her upright; and her final encounter with Boo Radley. Yet some of my favorite Scout moments sadly didn’t make it into the film, namely her interactions with her Aunt Alexandra, who is determined to cure Scout of her tomboyish ways and turn her into a lady, and her rebuke of her beloved Uncle Jack, who has punished her in haste for quarreling with her cousin before bothering to find out her side of the story. (He actually has to admit she’s right!) She’s hotheaded and quick to anger, yet she’s so darn likeable throughout, as she makes the mistakes curious children are bound to make and learns by observing and questioning the world around her. She’s one of the first fictional heroines to win my heart. The book develops Scout’s female mentors. If you’ve only seen the movie, here’s what you don’t know about Calpurnia, the Finches’ African-American cook: she’s a wise, intelligent, competent woman whose authority is respected in the Finch household and who shows Scout there is “some skill involved in being a girl.” (Thankfully the bit where she chastises Scout for her treatment of young Walter does make it onto the screen, at least.) Miss Maudie Atkinson also sets Scout a strong example of kindness, understanding, and even confidence, as she refuses to give others permission to make her feel inferior; when a gang of religious zealots tells her that she and her flowers are going to Hell, she proudly laughs it off. Scout may not have friends among the girls in her school, but the book easily passes the Bechdel Test thanks to her interactions with Calpurnia and Maudie. In the end, she learns as much from these strong women as she does from her remarkable father, Atticus. Childhood from days gone by is vividly portrayed. Once, when I taught the novel to a small group of students, one of them complained about the scenes in which Scout, her brother Jem, and their precocious neighbor Dill (modeled on Truman Capote) played outdoors without supervision, calling the scenes “unrealistic.” My heart nearly broke, and I still sigh at what this criticism says about the world we live in now, where kids like Scout, Jem, and Dill could never make the neighborhood their playground without fear of “stranger danger,” and might not want to in any case, being too busy with their video game consoles to imagine and act out the life stories of the mysterious Radley family. No one, I’d like to think, would welcome a return to the unthinkingly racist adult world Harper Lee portrays, but when I read about the fearless, imaginative play in which the three children engage, I can’t help but regret the growing sense of threat toward young ones in our present day, and feel grateful for the privilege of imagining myself a youngster once again and playing with Scout, Jem, and Dill for a little while. It’s a classic that melds artistry with humanism. In a popular culture where cynicism is all the rage, edginess is often assumed to be synonymous with intelligence, and nihilism is often coded as “realism,” To Kill a Mockingbird, with its insight and humor and deft handling of sentiment without lapsing into sentimentality, offers hope in the face of despair and even evil. (It’s worth noting that none of the novel’s characters, with the exception of the repugnant Bob Ewell, are 100% evil.) The book appeals to what is best in us, even though terrible things happen within its pages. I’m convinced this is a big reason why the novel continues to be not only read but re-read. Every now and then, when we’re tired of seeing humanity at its worst with nary a flicker of light in the darkness, it does us good to greet Atticus, Scout, Jem, Dill, Calpurnia, Maudie, Heck Tate, Boo Radley, and Tom Robinson as old friends. Yet at the same time, we’re looking for ourselves. At no time are we keener to see ourselves reflected in stories than in our adolescence, and I had the bad luck to be a teenage girl in the 1980s. I hadn’t discovered the fantasy genre yet, so I didn’t know of Tamora Pierce’s Alanna the Lioness or Robin McKinley’s Harry Crewe. I’d found Scout Finch and Jane Eyre, at least. Yet movies and television offered me no visions whatsoever of the girl I was or the woman I wanted to become. All the adventurers and the academic achievers seemed to be boys. Boys got to start nuclear wars and travel into space to become the last starfighter, but girls could only be those remarkable boys’ distinctly unremarkable girlfriends. None of the teenage Huxtable girls on The Cosby Show had any academic interests or aspirations that I could see, and over on Family Ties, the decade’s other top family sitcom, the situation was worse: a hyper-achieving boy, the star of the show, had a pair of foils in his shallow airhead sisters. In pop culture, it seemed, girls like me simply didn’t exist. I’d had my fill of invisibility when relief came at last, in the form of a skinny redheaded girl named Anne Shirley, as played by Megan Follows on PBS’s Wonderworks. Anne and I had one vital thing in common: we were daydreamers. We got lost in the worlds of our own imaginations, sometimes to embarrassing degrees. Anne could disconnect from reality long enough to forget to cover plum pudding sauce with cheesecloth, so a mouse drowned in it and ruined it. She could dedicate herself to fantasy to the point where she nearly drowned herself while acting out Tennyson’s “The Lady of Shalott.” Yet Anne’s world was so rich in color and life, precisely because of that troublesome imagination. She owned her daydreams, despite the problems they sometimes caused. I aspired to her courage, her zest. She was both what I felt I was and what I wanted to be. She loved reading, just like me. She wanted to be a writer, just like me. Why I hadn’t heard of Lucy Maud Montgomery’s books before seeing the PBS miniseries, I fear I can’t explain. Anne of Green Gables, the first in the series, is a beautifully written book, one I think every young girl should read. But I’m rather glad I first made Anne’s acquaintance through television, since TV was one of the main sources of my problem. The mainstream shows told me there was only one right, “normal” way to be a teenage girl, and that was to be concerned with boys, fashion, and popularity to the exclusion of all other interests and ambitions. Anne showed me a different kind of girl, one who could yearn for a dress with puffed sleeves and still earn top academic honors and tell wildly fantastic stories to delight her friends. I have never read the later volumes in the series where Anne settles down to the life of an ordinary housewife, and I don’t really want to. There’s Montgomery’s Anne, and there’s my Anne. My Anne, after the events of the first book, goes on to take the literary world by storm. So, which fictional heroines might make awkward young girl readers feel a little less strange or isolated? Take-charge Alanna, Keladry, Beka, and Daine from the pen of Tamora Pierce? Robin McKinley’s splendid Harry, Aerin, and Rosie? Rachel Hartman’s gifted, conflicted Seraphina Dombeigh? The wonderfully nerdy Hermione Granger, who refuses to back down despite ridicule even from her friends? These titles reflect my own bias towards fantasy, but there’s also Meg Murry, Nancy Drew (the earliest novels are actually the best), Gilly Hopkins, and even Ramona Quimby. The library remains the best place to search for fictional friends. The multiplex still isn’t so great, Pixar’s wonderful Inside Out notwithstanding, but then that’s a matter I’ve already covered here. As for television… well, Cartoon Network’s cancellation of Young Justice still rankles, as does the story that CN’s executives asked Paul Dini to minimize the female heroes’ participation, because too much girl power might alienate the boy demographic the network was aiming for. Weird, introspective, nerdy girls might find kindred spirits in print, but movies and TV might make them feel very alone. Still, some of them may find “their” Anne. Perhaps her name is Katara Water-Bender, or the legendary Korra. While browsing Goodreads, I came across a review for the second in the middle-grade series Dragon Codex. The book wasn’t as good as the first one, the reviewer said, because the lead was a girl. “That’s what every ten-year-old wants to read about. How a boy is the best.” This reviewer was not a boy, not a mother or father of boys, but a girl. Blessings on you, girl-child. I hope you find your Anne one day.